The best function of all times. IF function. Everyone has heard about it but only few can use it. So how does IF function work in Power Query? Well, there is a button for that. As usual. You will be able to complete basic IF conditions purely with the “IF function help wizard”. For the more complex conditions and actions, you need to either write your own IF function from scratch or edit an already existing one. So let’s have a look to the easier option today. So let’s take it step by step. It is now worth to have a look how this operation is recorded in Power Query M language. Power Query just drops everything into 1 row. It is not very user friendly. You may want to make the code look nicer and there is an easy fix to it. You can simply edit the code by wisely adding new line breaks while holding Shift+Enter. This edited formula below now does not look that bad, does it? There you have. 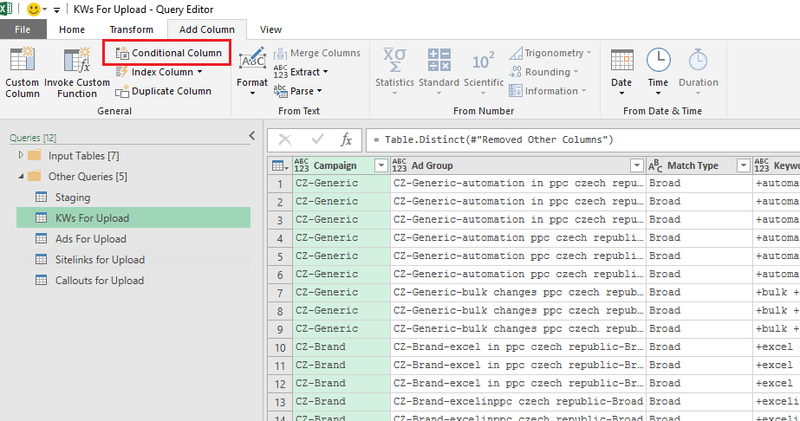 IF function is very easy to do in Power Query with the helper wizard – something you don’t really find in standard Excel. You can add a lot of conditions. I don’t know the exact limit, but you should be able to add around 200 rules via “Add rule” button. There are multiple operators available. They will probably cover most of your needs if you are just starting with Power Query.